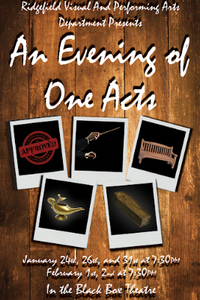 The Visual and Performing Arts Department of Ridgefield High School presents An Evening of One-Acts, opening Thursday at 7:30 p.m. in the high school’s Black Box Theatre. The short comedies to be presented are The Loveliest Afternoon of the Year by John Guare, Roll Over, Beethoven by David Ives, Beauty by Jane Martin, Perfect by Mary Gallagher, and Funeral Parlor by Christopher Durang. The directors are students in the Advanced Acting class of RHS theatre teacher and supervising director Sherry Cox. The full schedule of performances is January 24, 26 and 31, and February 1 and 2 at 7:30 p.m. The show is approximately 75 minutes long and will be performed without intermission. Tickets are $10 and will be sold at the door. Ridgefield seniors who have a Gold Card may enjoy one show for free but must have the Gold Card with them for admission.